Action Comics #957. 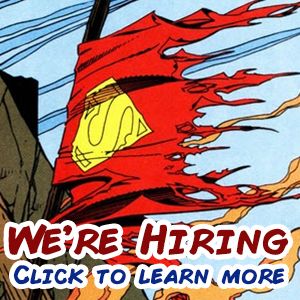 Dan Jurgens- Writer, Patrick Zircher- Artist, Tomeu Morey- Colorist. Goose bumps. Every so often a Superman story gives you goose bumps. Remember the montage in Superman: The Movie when he goes around making all those saves on his first night out? It’s that feeling. 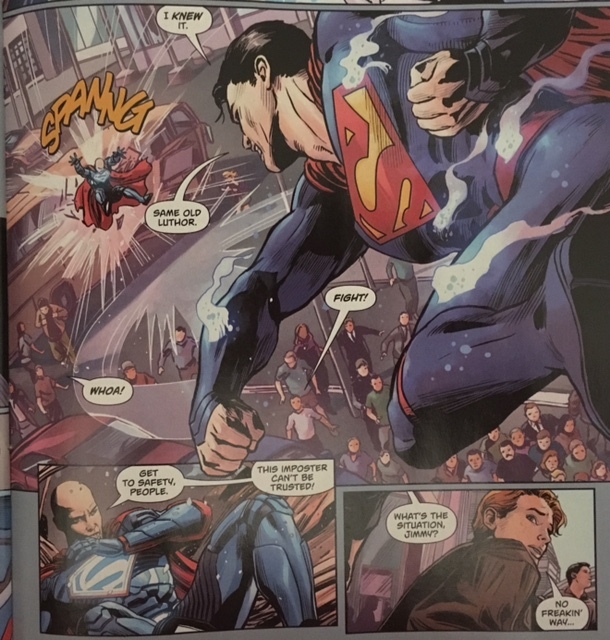 I’m happy to report that Action Comics #957 has a couple of those goose bump moments. 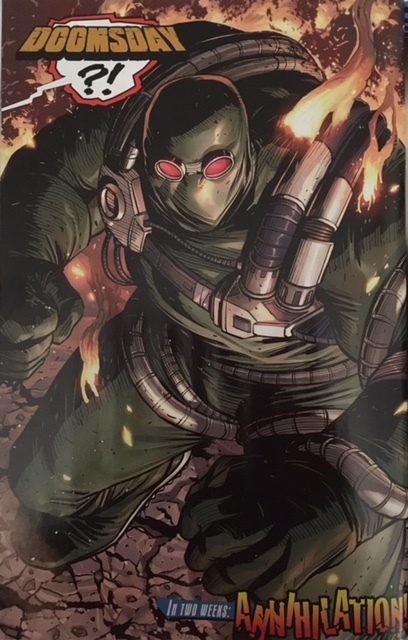 This has to be one of the most curious situations in comics- the lead character dies and is replaced by a version of himself from an alternate earth. Anyone old enough to remember the Third Life of Steve Trevor from Wonder Woman #270 in 1980? That was hard to wrap your head around, but this Superman situation is taking it to a new level. Trying to explain this continuity to the average non-comic book reader- Power Girl, anyone? 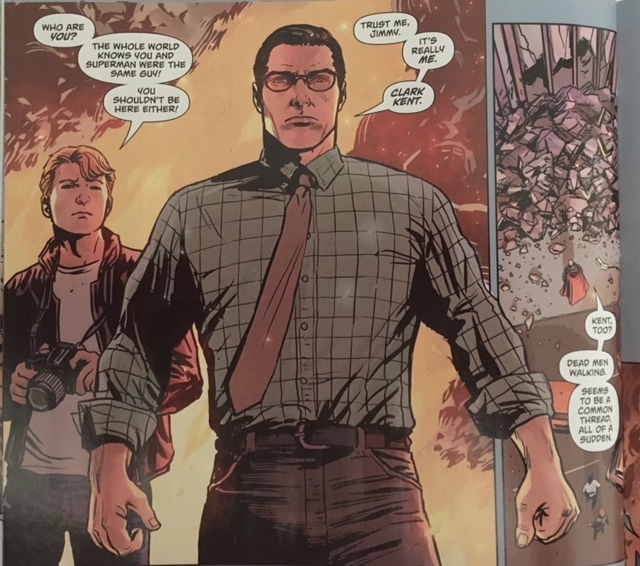 Action Comics #957 flows smoothly from the Superman: Lois and Clark mini-series as well as the previous Superman run which just ended last month. 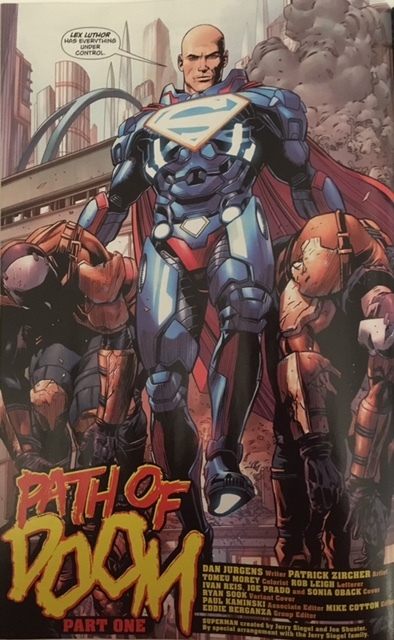 This issue sets pre-Flashpoint Superman up as the Superman of this world and firmly sets him at odds with Lex Luthor who has appeared wearing the “S” shield and red Superman cape. 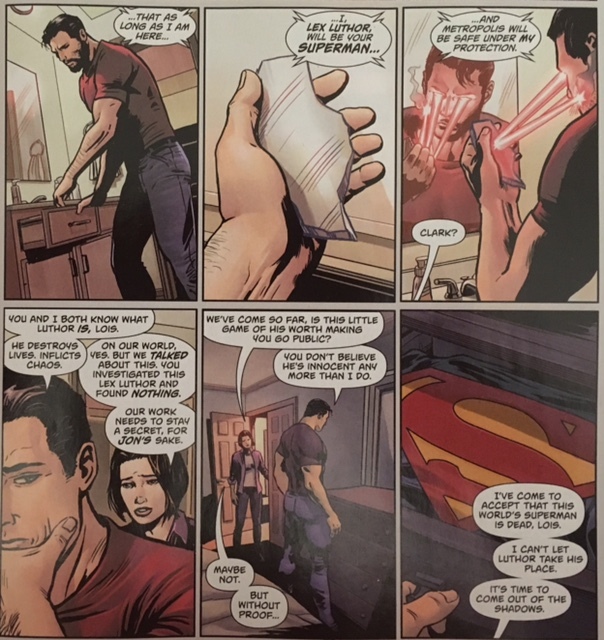 While he claims to be on the side of the angels, pre-Flashpoint Superman has had a long history with his Lex and trusts him not. Whether Lex will turn out to be good or bad, this issue sets them at odds, which is what you would expect. There are a few surprises along the way as well in the form of unexpected returns. Yeah, you know them already- Clark Kent and Doomsday! 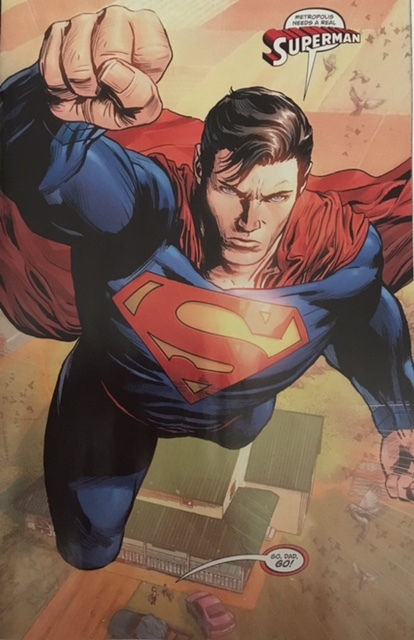 There’s a certain feeling that this pre-Flashpoint Superman elicits that the “New 52” Superman was never able to do for me. I tried, boy I tried. Something always just felt a little off about him. The excitement and hope that pre-Flashpoint Superman brings to the table is worth the $2.99 alone. Amazingly, there is a big gray area that is suggested by the events of this issue, however. Luthor doesn’t seem outright evil, and Superman seems like he’s jumping the gun just a bit to call Luthor out so quickly and publicly. It is easy to see how this will develop over the initial arc. The return of the believed dead Clark Kent creates a mystery that will pose a separate challenge for the Man of Steel. I’m imaging the resolution as a bizarre Mort Weisinger era new super power- Super-Amnesiac Duplication! Superman is able to create a duplicate of himself and then forget he did it. Ad infinitum. That would explain a lot. 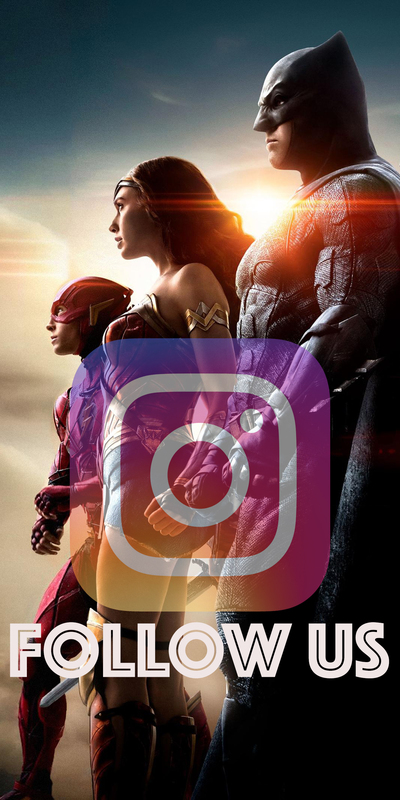 The ambiguity in Lex’s character is certainly intriguing. One wants to believe that he’s turned the corner and is going to be a hero. There’s enough in the issue to suggest both avenues. This is perhaps the cleverest aspect of Jurgens script. While I’m sure a lot of readers will be excited to see Superman show down with Doomsday again, this reviewer has never been a fan of the beast. He’s a one note behemoth that does nothing but destroy for the sake of destroying things. The Death of Superman story line holds a lot of resonance for readers and it is one of the defining moments of the post-Crisis/pre-Flashpoint Superman, so Doomsday’s inclusion is understandable. Make no mistake. If the “New 52” Superman wasn’t your cup of tea, give this book a try. 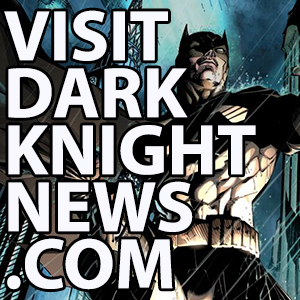 Jurgens makes it easy to understand what’s going on for new readers and provides a lot of moments for nostalgic readers all while setting up a couple mysteries worthy of the Batman.